Almost all brands with a decent social media presence have at some point leveraged the ongoing sixth season of the Indian Premiere League. While some being the sponsors have had to engage their online community, many others made good use of the season with a range of clever campaigns weaved around the IPL. But, this one by Cadbury Dairy Milk tops it all. In a cricket frenzied nation, the chocolate brand has managed to create a recall for ‘Shubh Aarambh’, the brand’s almost mnemonic catch phrase, suggesting consumers to have an ‘auspicious start’ with a Cadbury. 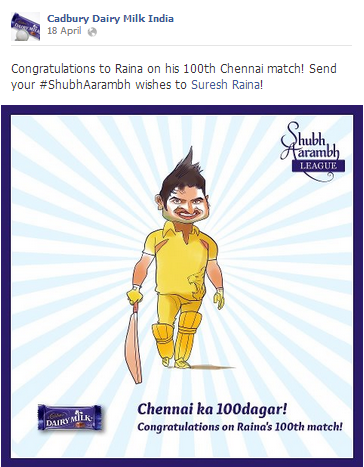 This IPL, Cadbury Dairy Milk launched the #ShubhAarambh League with the message ‘T20 ka #ShubhAarambh’, which was promoted on the brand’s Facebook cover page in addition to print and TV. The #ShubhAarambh initiative has also been spread to the community in the form of a fun, creative contest with gift hampers to be won and also a grand Championship winner. 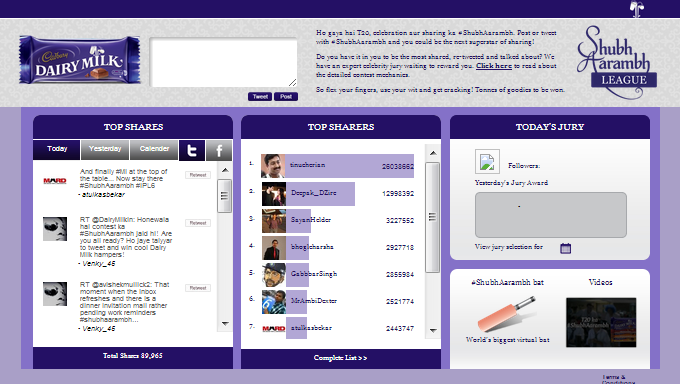 All you have to do is share Cadbury’s #ShubhAarambh related tweets on Twitter or share the same on your Facebook walls. You can also use the hashtag #ShubhAarambh to create your own interesting content. The social reach and influence for each participant will be measured on a daily basis, through the ‘Social Quotient’ score. The score factors your social sharing i.e. the number of times you share, and the number of people your message reaches out to. It also takes into consideration the quality of content you create, which is judged by a brand team after every match. The highest ‘social quotient’ score at the end of the #ShubhAarambh league, will take home the Championship award. The left pane pulls up all the content from Facebook and Twitter related to #ShubhAarambh along with the total number of shares at the bottom. Right now, the shares are close to 90K. The middle pane displays a leaderboard featuring the top ten participants with the highest score. The right pane shows the jury awards throughout the campaign duration with the #ShubhAarambh virtual bat at the bottom along with the latest ad film videos created for Cadbury. Interestingly, the virtual bat is made up of Cadbury dairy milk chocolates, where every 1000 tweets make up a bar. The bat has 90 chocolate bars at the moment! #ShubhAarambh has been pushed in a number of creative ways t00, be it the one-word description contest or the moments spent with mom during Mother’s Day. How cool is the #ShubhAarambh league? The campaign is a winner in terms of the concept and the timing. ‘Shubh Aarambh’ has been etched on our minds as something that brings an instant recall with Cadbury and new beginnings. Launching during the IPL, roping in cricket evangelists, connecting with social media influencers are some of the things that have helped to promote the campaign too, apart from the cool idea. The one thing I couldn’t find in the campaign is the prize for the Championship award – a chocolate trophy perhaps? The significant touch created by the campaign can be attributed to its quality tweets or Facebook posts by being topical, witty and catching the pulse of the youth. As stated in the AFAQS article, the campaign would be extended beyond the IPL season, which would be exciting to watch. Besides, connecting with youth, the #ShubhAarambh league will go a long way in creating a relevant and engaged online community, what do you think?